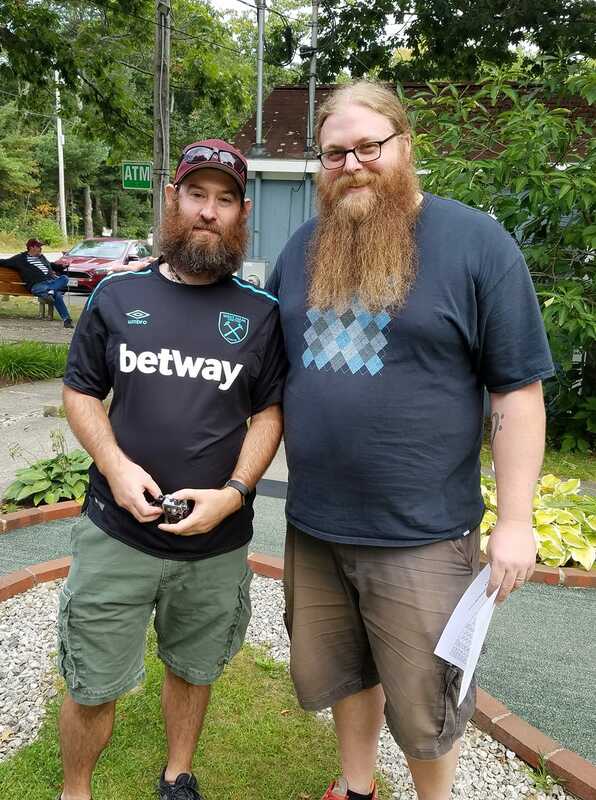 This is Part 2 of my trip to Maine for the 25th Maine State Dolphin Open. You can see part 1 in my blog archives. Day of the tournament is finally here and Highlighter gives me a ride to the course. The pairings are drawn that morning and I�m playing with Terri Lawson from Pennsylvania, who I know from many years at this tournament. I�m feeling good but immediately shank my first putt. Luckily it�s not too bad as I watch it hit off the brick and careen towards the hole � and gods be praised I get a lucky double bounce and it�s in for an unconventional ace! I hope that�s a good sign of things to come. It would be on that hole at least as I would ace it four times in a row (the last three being more �traditional� in style). I�m feeling good about my round, especially when I ace the double-decker 13 (which is all about speed to the small center hole up top) to go one under. Then disaster strikes on the loop at 14. I swear I�m good for this once a tournament, and I didn�t do it during practice, but I miss the loop one my first stroke. This is what happens when you try to outsmart the hole and put a little angle on the shot. Sometimes the best way to play a hole is just like you would if playing with friends, just whack it through the loop. I was trying to avoid the risk of a long second putt, which on this hole can have one of the most severe breaks you�ll see on the course, and instead left myself with a longer and way more difficult second putt. After getting it through the loop, I was still left with the putt I feared and I choked on it, taking a 4 and going to one over. This leads to one of the hardest things in our sport � shaking off one bad hole and realizing that one hole doesn�t impact the next. This is especially hard in a situation like this where the next hole is the often bogied hole 15 (I bogied it every time in practice) and now�s not the time to drop another stroke. However, I�m able to compose myself and get down on 15 for the two. I�d end the round one-over, which was a decent start even though I heard of a first round 34 by John O�Leary. I�d come back in the second round with a vengeance though, carding 4 aces and no drops for a 32. Not only would this tie for the low round of the tournament but I also aced 15 and being the first person to do so, I earned $100. This has been a tournament tradition and I actually think it�s the first time I�ve aced 15 in a tournament round. I finish the first two rounds in second place, one off the lead (John). I�m paired with John for the afternoon rounds and they are good, not great, with a 36 and 35, leaving me 4 under through four rounds (even after my second four of the day, this time on hole 18). While it�s not stellar I�m sitting in first place by a stroke! For the fifth round, I�m once again paired with John and I take yet another 4 (this time on 13 where I left my first shot well short) and after carding a 37 I�m down by two strokes to Randy Rice who has charged to the front with a 34 and 33 the last couple of rounds. If you�ve never seen Randy, he�s hard to miss, standing well over six feet and with the size of a linebacker. He�s also been on TV from time to time, in commercials, on Who Wants to be a Millionaire and most notably a season of his own show on the History Channel called The Smartest Guy in the Room where he did take some time to display his minigolf prowess. He comes to the tournament with some friends from NY and it�s always great to see these group of guys. I�m always happy to see him do well as I edged him out for first back in 2016. I�m between feelings at this point � on the one hand I know I can overcome two strokes on this course with a hot run of putts, but on the other hand Randy is on fire and looks like he�d have the wherewithal to stay with him. I also need to consider that Highlighter is only two strokes behind me and I know he�s gunning for a big finish. Rounding out the final foursome will be Steve hill from Maine, who�s a longtime player of this tournament and is on one of his best runs during a tournament � so it�s great to see him up here with us �young� guys. The whole situation gets put to the test on the second hole after our foursome surprisingly all deuces the first hole. After a rough hole by Steve, Highlighter aces, cutting into my lead by one. I�m up next and I follow with an ace, keeping my two stroke lead and then cutting into Randy�s by one. Randy isn�t fazed though and he follows with another ace and we�re back to where we started. Things get tight over the front nine as I can�t cut into the lead and in fact give up two more strokes so he�s sitting at four to the good by the turn. Highlighter also has caught up to me as I only shot par and he came put up a 16. Randy didn�t slow down at all on the back nine either, carding another 16 without a flaw. It was impossible to catch him in those final rounds and my hats off to him on getting his first win in a tournament he�s played and loved so much. I managed a very clean back nine, netting one ace on 16 to finish with a 35 and retain my second place finish. Overall I was happy with the finish. My rounds were pretty consistent and I was very happy that I had no �blow up� round this tournament, with my wort score being a 37. There was a couple of cracks in the day that I�d like to fill but there�s always room for improvement in any tournament. My attention now has to turn to our own tournament, the 2nd Matterhorn International Pro-Am. It will be a busy week starting with the league night tonight, practice on Friday and the tournament on Saturday. It�s double duty for me making sure I both am ready to play in the tournament and am ready to run the tournament. If you want to get some early betting in the favorites are going to be Highlighter (last year�s winner and winner of the Farmington tournament this year) and Randy (coming off the Maine win and who finished 7th last year). I�ll have some blogs from that tournament as well so look forward to more minigolf discussion!